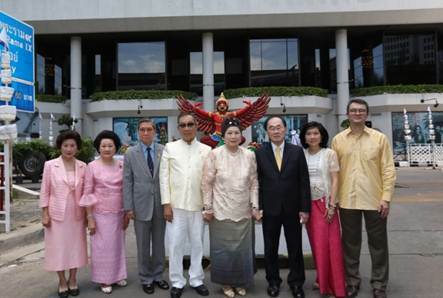 From the left: Rattana Norapallop;Mookda Uahwatanasakul; Prof. Viroj Lowhaphandu, honorary Advisor of board committee of Central Plaza Hotel PCL; Suthikiati Chirathivat, chairman, Central Plaza Hotel PCL; Khunying Suchitra Mongkolkiti, honorary advisor, Board Committee; Suthichai Chirathivat, vice-chairman; Supatra Chirathivat, senior vice-president for corporate affairs and social responsibilities of Centara Hotels & Resorts; and Thirayuth Chirathivat, CEO, Centara Hotels & Resorts. CENTRAL PLAZA HOTEL PUBLIC COMPANY LIMITED has received a Royal Warrant of Appointment, the first hotel company in Thailand to receive this honour, with Centara Grand at Central Plaza Ladprao Bangkok being the first property to instal the Supreme Garuda. His Majesty King Bhumibol Adulyadej had conferred the Royal Warrant on Central Plaza Hotel PCL last October , with the company receiving the Royal Warrant at a ceremony held at the Royal Palace on Feb. 4, 2014. The five-star Centara Grand at Central Plaza Ladprao Bangkok was the first hotel in what was subsequently to become Thailand’s leading hotel company, having originally opened in 1983. Royal Warrants of Appointment in Thailand are a rare and prestigious bestowment, granted only to institutions and companies that are seen to have a good and unblemished name, produce high quality products and services for the nation, and positively represent the Kingdom internationally. The Royal Warrant enables the company to display the Supreme Garuda on its buildings, company hoardings, letterheads and products. Central Plaza Hotel Pcl was founded by the Chirathivat family and incorporated on March 26, 1980. Centara Hotels & Resorts and Central Restaurants Group are operated under the company name. “This is a proud moment for our company, and a very great honour to be the first hotel company in our nation to receive this most gracious recognition,” said Suthikiati Chirathivat, chairman of the Board Central Plaza Pcl. “We have dedicated more than 30 years to helping develop Thailand’s hospitality industry, and to presenting the natural warmth and friendliness of the Thai people to international visitors. Centara Grand at Central Plaza Ladprao Bangkokwas selected as the first hotel to display the Supreme Garuda. It was the first hotel to be opened by Central Plaza Hotel Pcl, in 1983. The hotel was founded by Samrit Chirathivat, Vanchai Chirathivat, Suthiporn Chirathivat, Khunying Suchitra Mongkolkiti, Mukda Uahwatanasakul, Ratana Norpanlob, Suthichai Chirathivat and Suthikiati Chirathivat. With 607 guestrooms and a convention centre that could hold up to 2,000 guests, the project was a dramatic investment during an era of economic uncertainty. Situated on Vibhavadee-Rangsit Highway, in the booming business district of Ladprao, the hotel offers panoramic views of the adjacent Chatuchak Park, as well as of Bangkok’s spectacular skyline. Easy access to Suvarnabhumi International Airport is provided via the adjacent elevated expressway, with the journey taking just over 30 minutes. The downtown area is 15 minutes away. The underground Mass Rapid Transit and the BTS Skytrain both have stations conveniently located near the hotel. Centara Grand at Central Plaza Ladprao is connected to the BCC Hall, a prime venue for conventions, conference and exhibitions, and also to Central Plaza Shopping Mall, which features 300 retail shops, boutiques, restaurants and a multiplex cinema, combined with ample parking facilities. The famous Chatuchak Weekend Market is located opposite.